No doubt postmodern commentators would absolutely tear such a comment to shreds – and rightly so. While such a comment may indeed reveal a deep faith and trust in the Scriptures and the God who inspired them, it is also severely naive. It can be a frustrating experience for a Bible teacher to meet someone who insists no background knowledge of the biblical text is needed to understand it because God wrote it so therefore he must have made it speak to all generations equally. While the Bible does indeed speak to all generations, we should not confuse this as being synonymous with the Bible being equally understandable to all generations. The Bible is, of course, an ancient text, and so we must understand that the cultural and linguistic differences between us and its authors are significant. Thus, to really understand what was written requires some insight into the world in which the Bible was authored. It might be that you now think I’m a heretical nominee-for-a-stake-burning; after all, the Bible itself says “what is impossible for men is possible with God.” I urge you to read on and at least see my point and then judge me. I am offering the starting place for a possible model of interpreting the Bible, and that model is what I will call an Incarnational model. The central concept of this model is Jesus himself. Reconstruction of a first century male Jewish head. 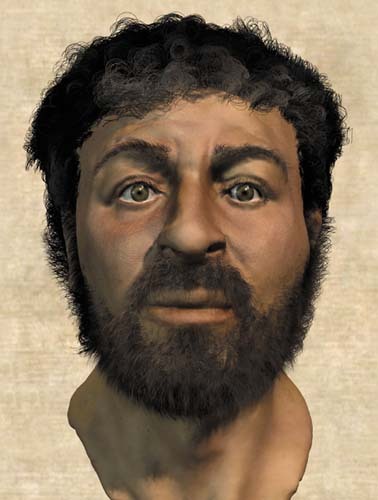 Jesus likely would have looked something like this. Jesus was born around 4BCE in Palestine. He was a Galilean Jew, from a poor peasant family living in a rural agrarian society. He was, by all estimates, a carpenter for some of his life. He then began his ministry at around the age of thirty as a single man who would never marry and who would remain poor. He never travelled more than a few days walk from his place of birth. Jesus was eventually killed by crucifixion as a political enemy of the Roman state. This was at least partly because of his protest against the Jewish religious/political system which exploited the poor and oppressed. Now, let me just make a few more points about Jesus before I move on. Jesus was not born in 3000BCE. Or 500CE. Or 1517CE. Or 2009CE. He was not an Ephesian, or a Western European, or an African, or an American. He certainly wasn’t a Gentile. Jesus wasn’t rich and didn’t live in an urban middle-class society. He wasn’t a blacksmith, or a doctor, or a school teacher, or an electrician. Jesus wasn’t married, and he never went to the UK on a work Visa. Jesus didn’t die from a heart attack, or cancer, or old age. He certainly didn’t align himself with injustice and exploitation. See, it’s one thing to say Jesus’ incarnation meant he became human and that he represented all humanity. It is another thing to say he became every type of human – this second statement would be incorrect. By being born just prior to the first century CE, Jesus necessarily wasn’t born in some other time period. By being born Jewish, Jesus wasn’t born Gentile etc. etc. etc. The point is that though Jesus is God, even God himself when incarnated could not possibly become every kind and type of human there is in the world – it would be impossible even for him. The Incarnation necessarily implies the narrowing down of God into a society, culture, time, place, race, gender, family, job, social status, personality type, hair colour, eye colour, accent, means of death etc. When God became human it meant that he took on the limits of humanity, even the limits of identity. If we look at the Bible in light of Jesus, then, perhaps we start to see some truths emerge. If Jesus was both God and man, and the Bible is meant to be authored the same way, are we able to see the analogies that arise? The Scriptures, being written by humans inspired by God, necessarily implies all the temporal, material and spacial limitations of this world, just as Jesus did when he became human. Such a way of looking at Scripture could have consequences for two opposing ways of interpretation that have gone before. 1) For the view that we can just read the Bible as is because God wrote it. It is unrealistic to think that God could somehow make any human language speak the same way to humans at all times in all places (by the way, keep in mind that the Bible translation you use is not the original text – it has been translated for you from the original Hebrew, Aramaic and Koine Greek. Can you read those languages? If not, are you really reading “what God wrote” per se?). I won’t say more because I feel like I have gone on about my point already in regards to this view. 2) For extreme postmodern views. Now don’t get me wrong, I think postmodernism (when looked at honestly) has much to say to us, particularly in its critique of the Enlightenment (and its dehumanising myths) and its attack on absolute objectivity (an impossibility). However extreme postmodern views, whereby texts simply mean whatever meaning I perceive them to have, are melted away by God’s presence in history. Jesus was actually a Jew, and he was actually killed on a cross, and was actually resurrected. If the Scriptures are at all analogous to this as I have suggested (maybe I’m wrong), then we must say there are actual cultural, temporal and spacial characteristics of the biblical text and that these cannot be simply swept away by perspectivism. Ultimately all I’m saying is that I think there is an analogy between the divinity-in-humanity of Jesus and that of the Scriptures. I think that this should be taken into account when forming a hermeneutic. My thoughts here make certain assumptions, yes, though they also force us to think seriously about what it meant for Jesus to be both God and man, and how the Bible is, in its own way, similar to this. If understanding Jesus means understanding his historical incarnation as a limited human, doesn’t the same apply to Scripture? Like I said these are just some thoughts thrown together into a suggestion for further thought. I hope they inspire you to go beyond what I have said, and to correct where I have said things that are not quite right. what is the purpose of the bible?